There is something wonderfully heartwarming about a proposal story. While we're all familiar with the large scale ones that make the paper or local news, sometimes it's the smaller tales without all the fuss that taste the sweetest. 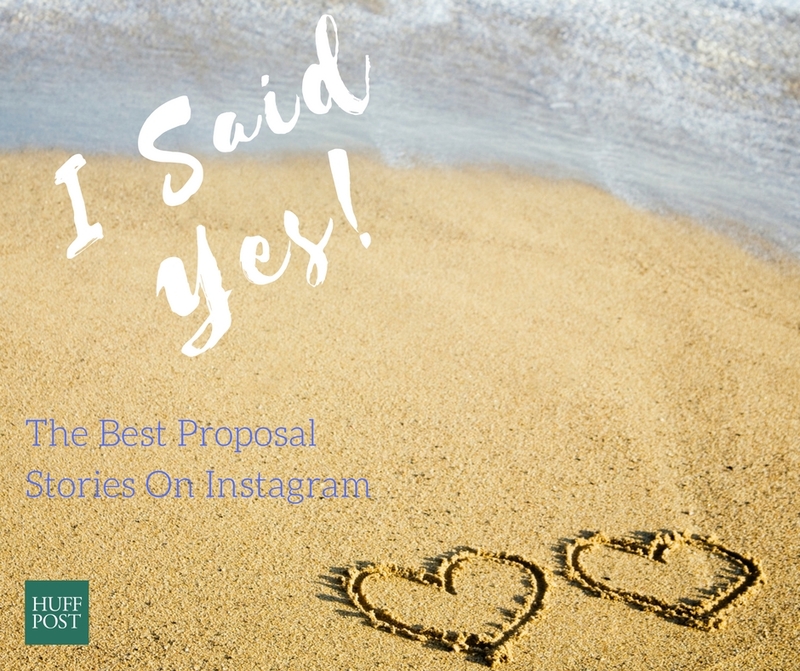 For the nosy romantics among us, social media lets us witness romance as it happens in real time (seriously, just try searching the hashtag "I Said Yes" on Instagram). And not only that, there are entire accounts dedicated to individual proposal stories. We've rounded up just eight of them that prove a proposal doesn't have to be all sky writing and flash mobs to be ridiculously romantic. Ah, love. Ain't it grand? 1. "My Dad proposed to my mom 30 years ago on Christmas Eve 1985, so I thought I would carry on the family tradition. My very first gift to Carmen was a record player when we started dating, then when I asked her to be my girlfriend, I gave her a "Girlfriend" vinyl record by N'Sync. So when I asked her to marry me, I thought a vinyl of "Let's Get Married" by Jagged Edge was fitting...."
2. "Mike got down on one knee and said, 'Bear with me, I've never done this before.' Even when proposing he still made me laugh!!" 3. "My girlfriend was under the impression that she planned the entire trip but little did she know, I had some tricks up my sleeve! It was everything that I imagined and couldn't have went any better." 4. "What I thought was going to be our final date night before our first day of school as teachers actually turned into a night I'll never forget. My boyfriend took me to the National World War I monument since it has a beautiful view of the city and we are both social studies teachers, and he popped the question. After I gave my overwhelming 'YES!' my two friends popped out -- they'd been taking pictures the entire time!" 5. "He cooked me dinner and got flowers as a thank you for throwing him a surprise 30th birthday party, next thing I knew I was engaged." 6. "I knew I wanted to do it in Paris so I decided to give Derek that as his birthday present to make it less suspicious. After that I started designing his ring. After a month of a few adjustments I finally made the perfect ring for Derek." 7. "On this beautiful day George took his partner Alex on a typical weekend morning walk when suddenly she stumbled upon a romantic picnic set up under the trees in Sydney's botanical gardens which overlook the world famous Opera House. She said YES!!!" 8. "He met her outside of yoga class holding two cups of mulled wine and took her to Central Park, the spot on their second date where he realized he loved her. He's a surgeon; she's an anesthesiologist."